You can see in the pic above that training load is the biggest factor in sports injuries. Given most running injuries are overuse injuries reducing the training volume is the place to start when looking to reduce knee pain when running. After this, you need to identify if there are any notable strength deficits and address these. 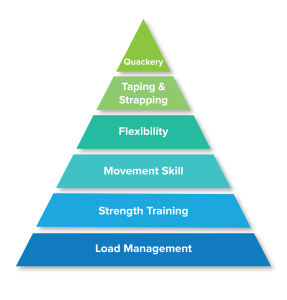 After these, it is then about looking at, and improving where needed, running technique. 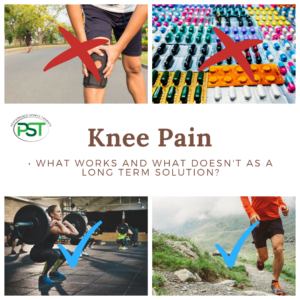 The knee is at the beck and call of the ankle and hip so some quick assessments of both of these joints are going to give you some cues as to the source of the problem. For the ankle, the knee to wall test is a great one to let you know very quickly if you have a sufficient range of movement in the ankle. In this test you are looking at 10 cm as a minimum standard. Whilst we are rarely symmetrical you don’t want to big a difference between legs but a difference of 2 cm is considered to be ok. That is unless one is 10 cm and the other is 8cm. For the hip, a simple knee to the chest is a good one to give us some good general info about the hip. 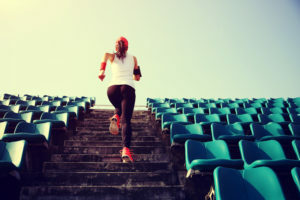 You don’t need a huge range of movement in the hip when you are running but being able to get your knee to your chest is no more than normal range of movement. When doing this you want to engage your abs a little to stop the spine flexing and giving you a false positive. If you can’t touch your knee to your chest it doesn’t mean that the problem is coming from the hip or that there is a problem with your hip. What it does tell us is if your hip is a bit stiff, you can almost touch your chest, or very stiff, nowhere near touching your chest. When combined with other information this may be important. 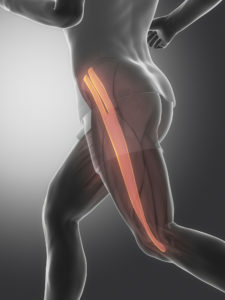 How much range of movement do you have in the knee itself? This is more about how much flexion you have. You should be able to touch your heel to your glutes both lying on your back and lying on your front. Lying on your back is checking primarily the vastus group of muscles and the knee capsule whilst on your back rectus femoris comes into play. How much pain is ok? Given the long-standing nature of many of these problems, it is unrealistic to think of going through rehab completely pain free but how much is ok? As a rule of thumb 2-3 out 10 is ok with the following caveats. The pain does not get worse after immediately after training or later in the day. 2. That it isn’t present the following day. 3. 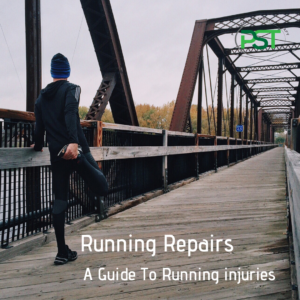 During a run, it is only noticeable towards the end of a run or beginning in patellar tendinopathy. 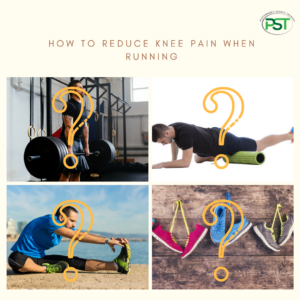 If you are experiencing knee pain when you run why not sign up for our FREE 14 day Knee Pain Solution. Over the 14 days, we’ll take you through exercises, stretches, soft tissue work that will help reduce your knee pain. Next PostNext Is sports massage painful?